How do I download the 3D Name? In order to download the 3D Name Wallpapers you must be logged to our website and have enough credits to download the name you want. How do I get more Credits if I have run out? But I don't want to bother sharing a link? Then please buy some credits... simples! Why do I have to "Share" the link? Here at 3D Name Wallpapers I try to offer my content for Free so that you don't have to pay any money. However I do have running costs such as server equipment, software licensing and it takes time for me to render out and make the 3D Names that get requested! Everytime you share my website I get new users and therefore I generate some income from the advertising on my website. So please help spread the love and "Share" the 3D Names link with your friends and family to start eanring credits you can use to get your 3D Name wallpapers for Free! How do I search for my name? You can either search from the homepage, or by clicking on the magnifying glass icon on the top right of the menu to bring up a search box. 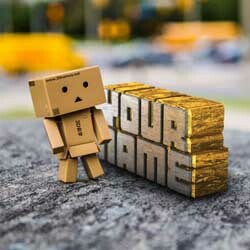 Just type your name into the box and hit enter to see the available 3dnames that we have for you. What happens if you don't have my name? Right now there are 84,419 available 3D names to choose from, these have been added over time based on what users have searched for so only the most popular searches get created first. However if you would like to make a name request then I will have to spend some time to make these new names for you. Seeing as these will probably be unique to you I ask that you use the credits system to share our website on order to get credits that you can use to make this request. 3D Names are made by a crack team of highly trained monkeys who are skilled in the art of using 3D Software... they get fed bananas and in return they like to render out lots of names in 3D!